www.PowderBulkSolids.com 33 J u n e 2 0 1 8 time, the system will display a Low Pressure alert on the HMI screen. The above partially illustrates the customized process control system designed and imple- mented by Sterling Systems & Controls, Inc. It continues with complete automatic operation of all the process equipment required by the seed processing customer. 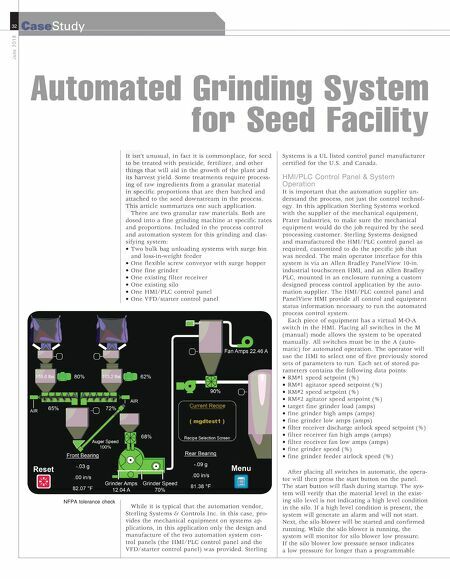 This includes moni- toring and controlling all items listed above, in order to produce the necessary finely ground and blended raw materials for fur- ther use in producing finished and coated seed. The HMI/ PLC panel also includes all the weight instruments for the two loss-in-weight feeders within the bulk bag unloading systems. VFD/Starter Control Panel The VFD/starter panel encloses the electrical controls required to operate all of the process equipment items. This is a 480VAC panel and includes: a control transformer, VFDs and motor starters for the bag un- loaders, feeders, a fine grinder, all airlocks, and other process equipment items within the overall system. While not included in this spe- cific system, the company can interface with a local business system and can also provide a supervisory remote control application if desired. This is called WebCentral supervisory control. WebCentral is a soft- ware package that allows corpo- rate users to access the database of a Sterling Systems process control system, such as the seed process equipment discussed. This can be used to enter and manage all configurable items remotely using a PC's web browser. Sterling Systems & Controls Inc., Sterling, IL, has over 40 years of experience providing effi- cient process automation solutions, including batching systems, mi- cro/minor ingredient systems, bulk weighing systems, bulk bag un- loading system, and plant process automation. For more information, call 815-625-0852 or visit www.sterlingcontrols.com www. 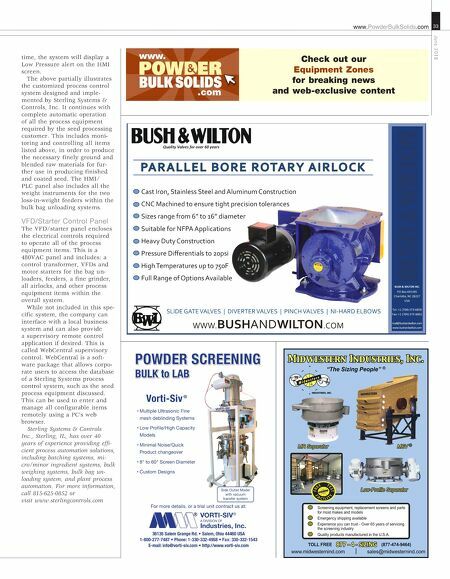 .com Check out our Equipment Zones for breaking news and web-exclusive content VORTI-SIV POWDER SCREENING BULK to LAB Vorti-Siv® ₔ4\S[PWSLdKE/E! ȁȁȁ!" ǡ" " •••ǳ••ǳ" •• " --" ơ" " • •" ! ǤǤ! ! ! ! ! ! ! ! !